This coming weekend sees the Spring Open Weekend of The London Gardening Club, 30th, 31st and 1st. Look out for their adverts and leaflets in local shops and business, which have vouchers and offers. If you visit or join you can stop off in The Blue Rooms Café onsite, for a home cooked lunch, cup of tea and cake too. The London Gardening Club is a brand new independent Garden Centre on the Ongar Road, near to Abridge and Theydon Bois. The owner, Amy Pritchard, is a local girl, born and bread on a family nursery in Mott Street, Sewardstone, still run by her brother Richard, and the family business supplies many of the luscious perennials and seasonal bedding plants sold at her garden centre. She’s trained in garden design at Capel Manor in Enfield and runs her garden design service from the garden centre, asquared gardens by design and so is on hand to answer and help with any garden questions. The London Gardening Club are determined to make this venture a locally grown, locally produced garden centre, wherever possible, using plant suppliers from within the local area. To add to this they have engaged the work of a local carpenter, to make planters and local trellis maker to supplier the same. To make the most of the London Gardening Club you can become a member for free and receive a loyalty card which will be stamped each time you spend £10 and as the stamps build up you will receive free plant that is on offer that week or money off your next visit so it could be worth going back time and again, Especially as they are just opening and these early days are seeing their stock grow and site change by the week! 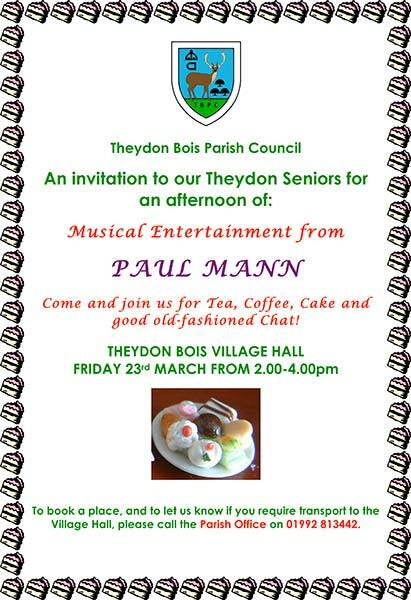 Notice is hereby given that the Annual Parish Meeting for the Parish of Theydon Bois will be held at Theydon Bois Village Hall on 29th March commencing at 8pm. 1. The usual monthly Parish Council Meeting will be held immediately after this meeting. 2. This is not a Parish Council Meeting it is a meeting of all the local government electors in the Parish. 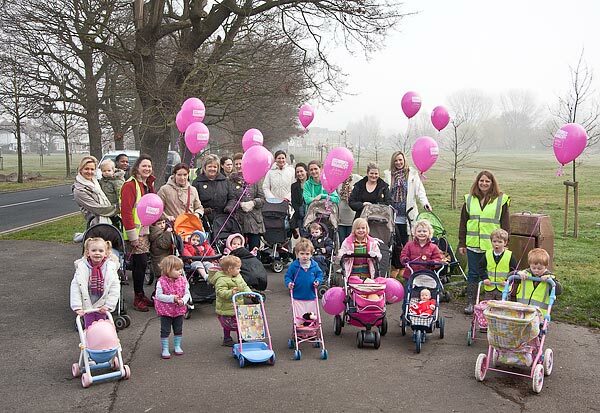 This mornings heavy fog did not prevent the mum's from St. Mary's Mum & Pram Group continuing with their sponsored laps of the village green in aid of Clic Sargent (children and young people with cancer) between 10.00 & 11.30 am. Their pink balloons and the bright visibility jackets of the stewards meant they could still keep track of one another on the way around. 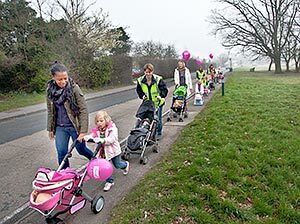 Walking with the Clic Sargent balloons and a collection box they collected from villagers to add to the "£2 a lap of the green" sponsorship money already promised by supporters. After the circuits it was back to St. Mary's Church Hall for the mums and children to enjoy some well deserved cakes and cups of tea. 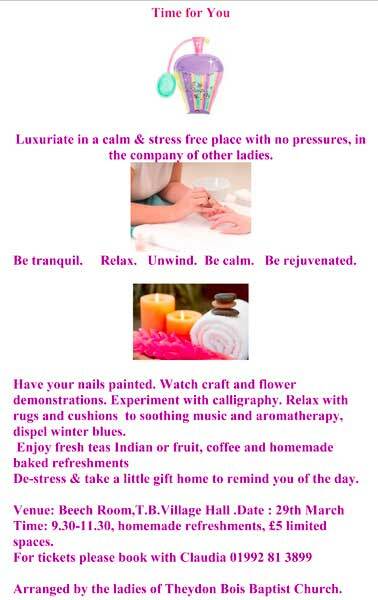 Time for a luxurious and stress free day in the Village Hall Beech Room with various 'unwind' treatments courtesy of Theydon Bois Baptist Church Ladies. Tel: Claudia on 01992 813899 to book or for more information. 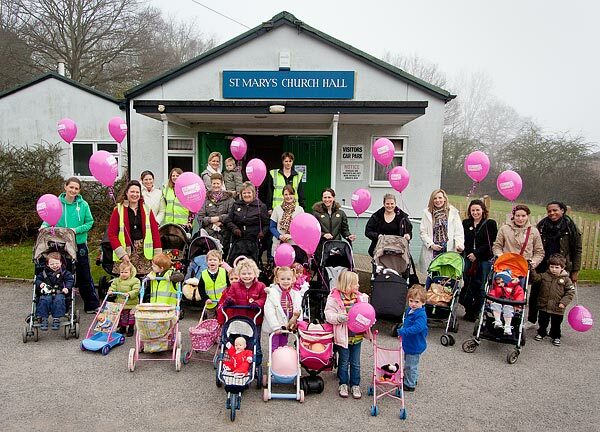 We will be holding our May Fayre on Monday 7th May 2012 from 11am-4pm at St Mary's Church Hall, Theydon Bois. Lots to do for all the family with refreshments, BBQ, bouncy castle, children's sideshows, bric-a-brac, books, plants and much more besides. Please come along and join in the fun! 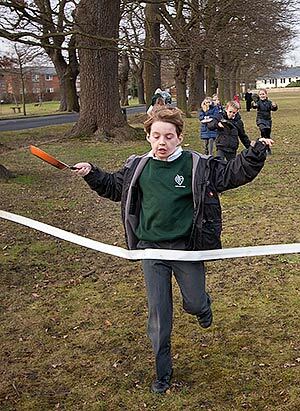 The Avenue of Trees echoed to the sound of fun and laughter yesterday when Theydon's Pancake Day Races in their revived form took place beside the avenue for the second year running. Former Parish Council Chairman and School Governor John Eaton again helped organise the event with Elspeth Bonds head teacher at Theydon Bois Primary School. John and Elspeth resurrected the tradition last year following years with no open air event due to bureaucratic difficulties. Problems still arose this year but thanks to the efforts of John and Elspeth the event was finally allowed to go ahead the day before. None of this bothered the children who threw themselves into the event cheered on by teachers, parents and fellow pupils. 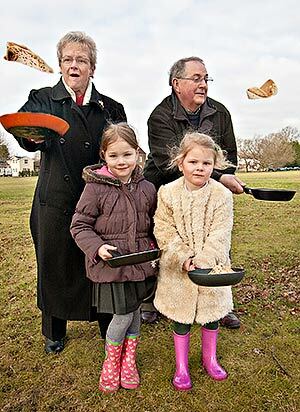 Elspeth & John instructed the smaller children in how to toss pancakes while running and then started the races. A number of races took place between 9.15am and 12 Noon and each child received a small sticker badge for taking part with a small prize for the winners. But for everyone present it was more about the fun of this old tradition now revived. Strangly though there wer no takers for the 'tossed' pancakes at the end! We have a photo gallery of yesterdays races and more about the revived event can be found in the June 2011 Village News. The site of the Old Foresters club in Abridge Road, Theydon Bois, has been contested by a number of developers in recent years, and in 2010 Parkeng Ltd and developer James Harris submitted rival plans for the site. Parkeng applied to build a 178 space commuter car park in the field while Mr Harris wanted to build training and leisure facilities there. On 10th February a senior lawyer at Epping Forest District Council confirmed that "Parkeng Limited has withdrawn their planning appeal for the commuter car park application and accordingly the Public Inquiry that was scheduled for 20 March 2012 is now cancelled". "Following the completion of this appeal statement it has been brought to my attention as the agent that he (James Harris) has now acquired the whole site in question. The appeal refers to a 1.07 hectare site, however part of the included in this appeal refers to a 15 acre site". "This is a result of the appellant persuading the freeholder (Parkeng) to withdraw his appeal for the ajoing car park. The appellant (Diverse Care UK Ltd.) realise there is no current planning on the site, but felt it was vital for the future of the academy and Local Parish to take advantage of this opportunity. As a result, the academy will not make use of a derelict site but now with the outdoor activities extended to an additional 15 acres will better preserver the 'openess' of the Green Belt and create a strong defensible boundary between the remaining areas of developable land and the village".
" We are surprised at this statement, made some time in January, because we were advised by EFDC Senior Lawyer, Ruth Rose, on Friday 10th February that the Appellant had withdrawn his appeal on the commuter car park that day. We attended a Pre Inquiry meeting at EFDC, with Counsel, Parish Councillors and other Representatives of villagers on 3rd February and it was clear at this stage that Parkeng still intended to continue their appeal. We consider it unlikely that Mr. Harris/Diverse Care had any influence over the decision and that it was almost certainly advice from their legal team that persuaded Parkeng to withdraw their appeal following the EFDC statement to the Planning Inspectorate. We have written to the Planning Inspector and EFDC regarding this addendum as it certainly clouds the issues regarding this appeal". Villagers are angered that EFDC Enforcement Notices against the spread of inappropriate structures and development on this Green Belt site have been issued for sometime, but have not been complied with. These notices finally ended in Magistrates court action, but the buildings have still not been removed by the appellant of this application. Pupils at Theydon Bois Primary School have taken part in a gymnastics festival at Epping Sports Centre. Twelve Year 1 and 2 pupils were involved in the Key Stage 1 event which featured children from six local primary schools. The session was taken by the Epping Sports Centre Gymnastics Club. After a chance to make new friends the children warmed up and learnt some gymnastic positions. Each group was taught a short sequence of movements including forward rolls, straddle balances and broad jumps. Each gymnast received a certificate from Olympic canoeist Fiona Pennie, who is currently ranked fifth after the World Championships. Actually it needs your garden! Theydon Youth are hosting the 32nd Open Gardens’ Day. Last year we raised over £3000 and had over 650 visitors, despite a train strike and a heatwave. All money raised goes to Theydon Youth to buy equipment or to fund activities. Visitors delight in seeing what Theydon has to offer and walking round a varied array of gardens, with the chance of a delicious Ploughman’s Lunch or Cream Tea in the Village Hall. We are currently compiling the list of gardens that will open and are always looking for new gardens to list as well as the regular or returning entries. Any garden would be welcomed to open both informal and formal. If you are interested in opening your garden or would like any further information please contact Thea Buisson on 01992 815982 or Karen Collins on 01992 812295. Theydon Youth once again were awarded a 3 star rating at the Essex Youth Council Award evening held at the Civic Offices in Epping. Unfortunately 25% of the Youth Clubs that were graded last year have since had to close due to lack of funding. 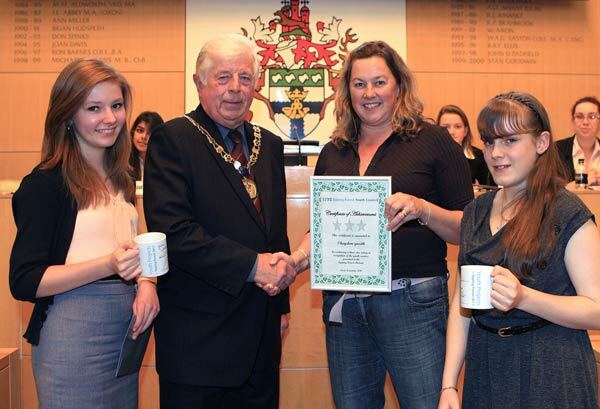 Theydon Youth are in an enviable position of not depending on funding to stay open. The helpers that run the club are all voluntary and Theydon Youth, with the backing of the Community and Youth Trust, carry out fundraising to raise funds for equipment etc. Theydon Youth are hosting this year’s Open Gardens’ Day on June 24th and the Trust are planning to organise an Elvis night later in the year. Details are currently being finalised to open a Junior night for Theydon Youth which will allow 8 to 11 year olds to use the Centre and facilities. Help is always required so if you would like to volunteer for either Tuesday or Wednesday (junior) night please contact Thea on the number above. Both nights offer children a chance to meet up outside of school in a friendly environment along with a chance to play pool, table tennis or watch films/TV. We also now have internet access. Tuesday night is for school years 7 to 11 and is open every Tuesday from 7 till 9pm. The Community & Youth Centre itself is thriving and being used throughout the week by various groups, details of which can be found on the Village website. 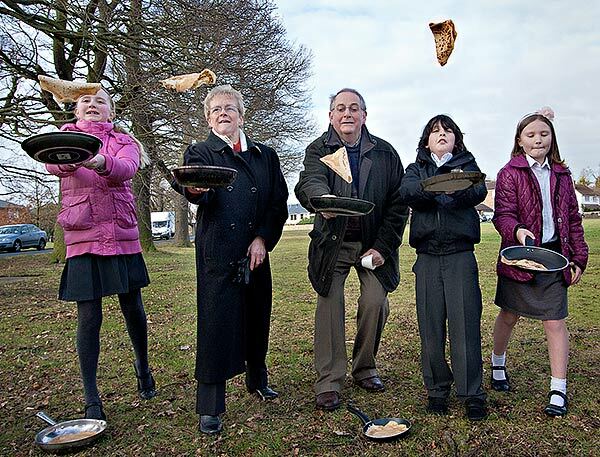 Last month the Parish Council voted to give the Community and Youth Trust a lease at the end of which ownership of the site and buildings will be transferred to the Trust for a peppercorn rent. Details are being finalised along with legal advice and full details will follow as soon as the terms of the lease etc. are finalised. If you are interested in renting the Centre then please contact Karen Collins on 01992 812295. 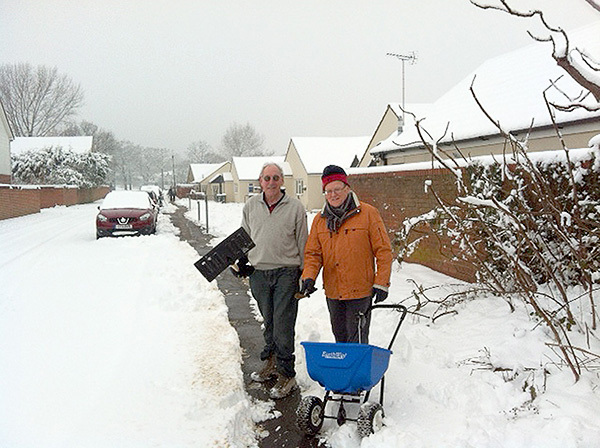 Theydon Bois Parish Councillors George Howard & Peter Hammond clear snow and then salt path up to doctors surgery with TBPCs newly acquired salt spreaders. The recent heavy snowfalls have allowed the first trial of these new spreaders. Join us for some good clean raucous fun at our Cockney night! 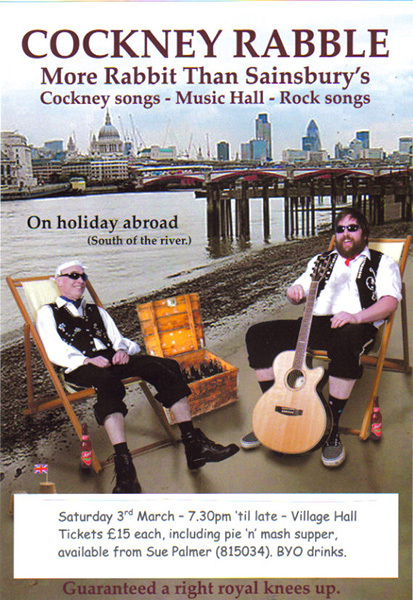 Our evening will be led by professional double act Cockney Rabble that entertain you with their wide repertoire of cockney songs from every decade - from music hall to modern rock - as well as their "cheeky chappie" banter and rhyming slang. 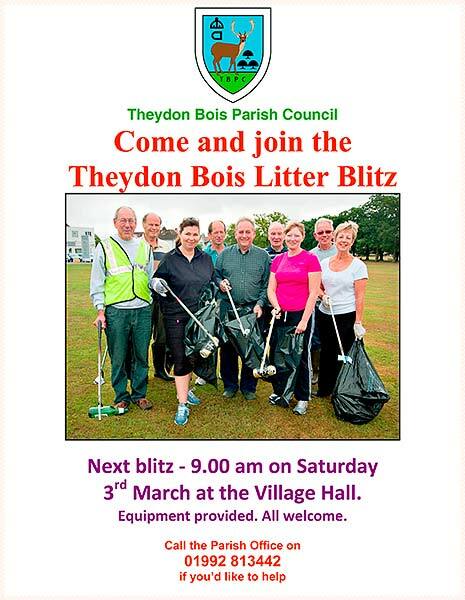 The fun will take place on Saturday 3rd March 2012, from 7.30 - 11.00, at Theydon Bois Village Hall. Tickets are £15, . Tables of 8-10, or individual tickets, can be purchased from Sue Palmer (815034). BYO drink and glasses. 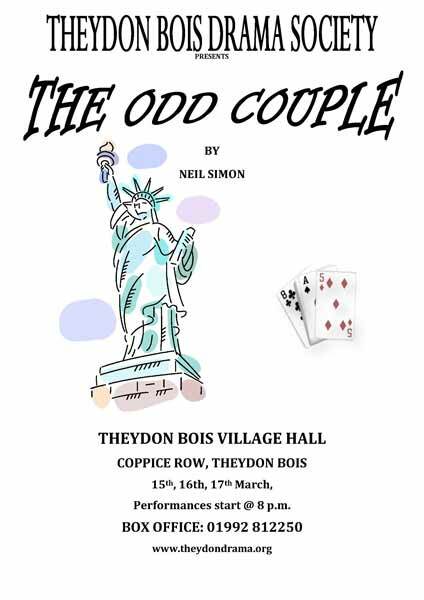 This year, being the Olympics and the Queen’s Diamond Jubilee, we intend to deliver a free Show Schedule/Year Book to most households in the Village in the hope that this will encourage more entries in our Show. Please look inside and see if there is something that you can enter, be it fruit, vegetables, flowers, cookery, photos or handicraft. We are having some Novice Classes this year and of course we have the Junior Section for children of all ages up to and including 16 years old. We are having a scarecrow competition again so why not make a family entry? The Men's Forum has now published the 2012 list of speakers at their meetings. Full details of this and membership on our Club Details Page. Village News Editor Tony Ames made a brief appearance on Essex Radio's Ray Clark Breakfast Show this morning speaking about our award for the Best Community Magazine in Essex (see below). The Ray Clark Show goes out every morning between 6am and 9am with Essex local news and stories. 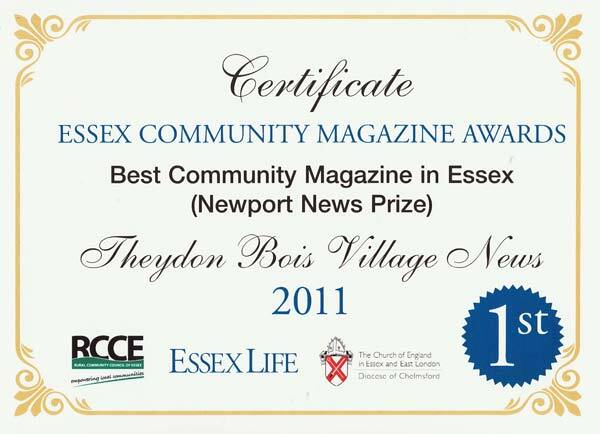 Our Theydon Bois Village News magazine has been crowned the winner of the Essex Life Community Magazine Awards for the second year running. This is a fantastic achievement for our Theydonnewsdesk Team: in particular for Tony Ames (Editor) and Jim Watts (Web-Editor/Photographer) who are the driving force behind the magazine. 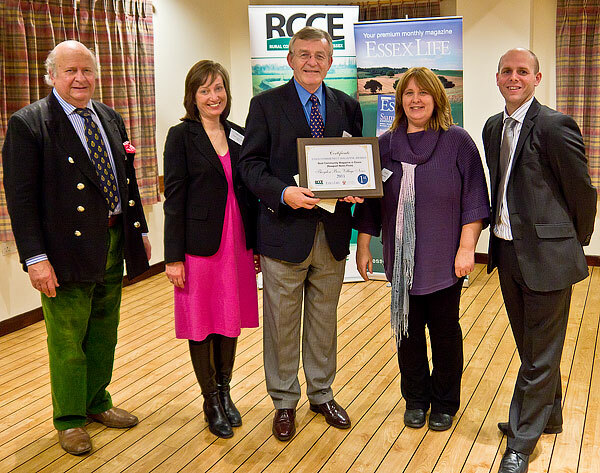 The Rural Community Council of Essex teamed up with Essex Life, Newport News and the Diocese of Chelmsford to promote this competition to celebrate community magazines. There were 62 entries this year and competition as always was fierce, with standards of presentation and production improving year on year. The awards are open to editors of not-for-profit community magazines in which editorial work is undertaken on a voluntary basis. The 16 short listed finalists were invited to the awards ceremony held at The Magic Mushroom Restaurant in Billericay last night (25th Jan.), and I was delighted to be invited by Jim and Tony to attend as their guest. We all held our breath as the four merit awards were announced followed by the award for the best new community magazine. The three place winners were then announced in reverse order and to our surprise and delight Theydon Bois Village News was announced as the ‘crème de la crème’ of Essex Community Magazines. Winner of the Newport News Prize for a fantastic second year running! This means Theydon Bois Village News has achieved the 1st place 3 times and one 3rd place in the past 5 years (ther was no competition in 2009). Tony had not prepared a speech as we really did not expect to be lucky enough to win again, but he came up trumps with a witty and heartfelt tribute to all those involved. We had to smile when he likened the production of each edition to a birth in the family … the sense of amazement when the edition returns from the printer in its full glory and the feeling of ‘did I really do that’. Well yes … you did Tony and Jim, and you have been doing it with amazing commitment and success for the past eleven years - so many congratulations! Local magazines are a much loved part of community life. They play an important role keeping people informed, entertained and up to date with what is happening locally. Theydon Bois Village News is a credit to our Village, to all the volunteers who deliver it every quarter, to everyone who contributes and to everyone who reads and enjoys it. Web Editors note: Sally as well as working hard as our Parish Clerk also helps co-ordinate the sponsorship and news contributions for our magazine and the Website. The Editors would like to thank her and all our sponsors, contributors and volunteers for their help. Without them Theydon News Desk would not be able to function. The Public Inquiry relating to the appeal against the Councils refusal to grant planning permission for a Commuter Car Park on the former Foresters Site in Station Hill (EPF/1134/10) has recently been scheduled by the Planning Inspectorate to be held on 20-22 March 2012. 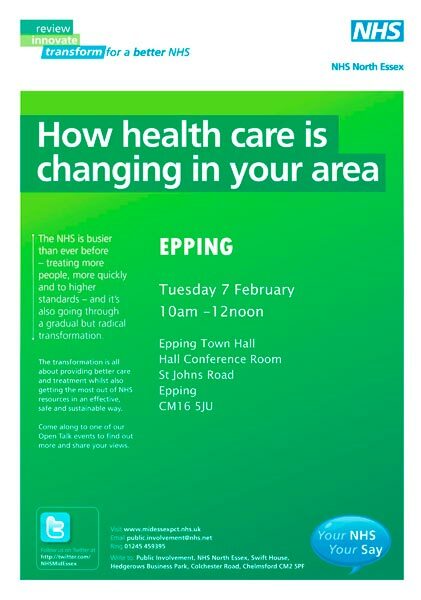 The Inquiry is open to members of the Public and will be held at the EFDC Civic Offices in Epping. Theydon Bois & District Rural Preservation Society, Theydon Bois Action Group and the Parish Council have all made submission regarding the appeal. See the earlier News article Here. 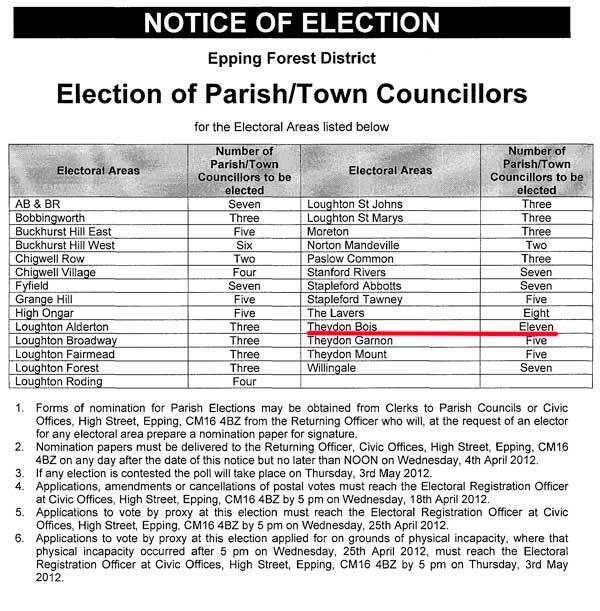 The Full List of Parish Council Meeting dates for 2012 is now available on the PC Meetings Page. 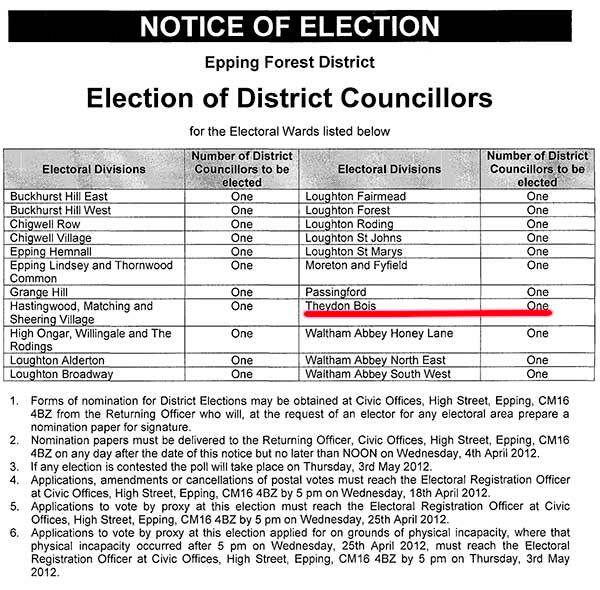 There may though still be some revision of these dates because of the Parish Council Elections that take place this year. The recent appointment of Margaret Lechley as Assistant to the Parish Clerk has allowed the Parish Council to now open the Parish Office to the public for 5 mornings each week. The Acting Parish Clerk, Assistant Parish Clerk or Responsible Financial Officer are normally available weekday mornings at the Village Hall. As from January 2012 Greville Norman (Responsible Finance Officer) will be in the Parish Office on Mondays from 10.00 a.m until 12.00 M/D, Assistant Clerk Margaret Lechley will be in the office Tuesday from 10.00am to 12.00 M/D and Parish Clerk Sally Crone will be available in the office on Wednesday, Thursday and Friday from 10.00am - 12.00 M/D or thereabouts. Officially the office will be open to the public to visit from 10 a.m until 12 noon Monday to Friday . At other times, or if the clerk is out of the office, messages can be left on the answer phone: No. 01992 813442. 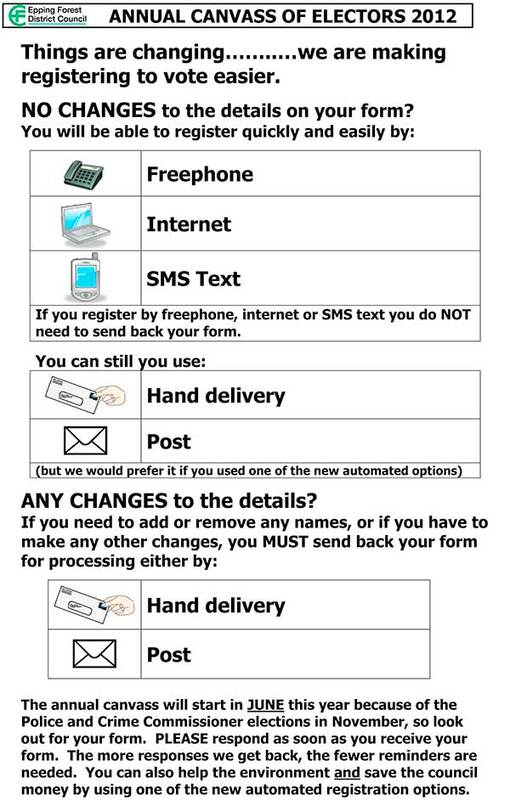 Faxes can also be sent to the same number.